Salzburg, Austria has become a must-see destination for tourists who enjoy history because, well, Salzburg is full of history. Tourists can visit the birthplace of Wolfgang Amadeus Mozart, follow in the footsteps of the Von Trapps (yes, Salzburg is the setting for The Sound of Music), or explore Altstadt, which is world-renowned for its baroque architecture. There is so much to do and so much to see that many tourists can find the city overwhelming. Fortunately, AESU has you covered. AESU offers several fun-filled trips to Salzburg, Austria, including our Euro Focus, Great Escape, and Alpine Winter Adventure. Salzburg sits on the border between Austria and Germany and is the capital city of the province which bears its name. It’s the birthplace of Mozart and setting for the film The Sound of Music, but this is just the beginning of what Salzburg has to offer. The area now known as Salzburg was first settled by the Celts around the 5th century BC, and was later united by the Roman Empire in 15 BC. At this time, the city was known as “Juvavum,” which became a Roman municipium in 45 AD. However, by the late 7th century the city lay in ruin. That was until Saint Rupert built his basilica in the area which he named “Salzburg,” meaning “Salt Castle.” The name was derived for the barges that carried salt on the Salzach River. 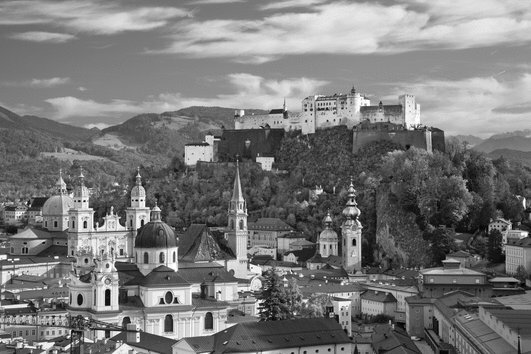 Salzburg secured its freedom from Bavaria in the late 14th century. By the 17th century, Italian architects had rebuilt the city center – Altstadt – in the baroque style, which can still be seen today. Affordable Trips to Salzburg, Austria – Experience the History Firsthand! Want help booking your trip to beautiful Austria? Please contact AESU by calling 800-638-7640 or fill out the contact form found on our website. And don’t forget to check out all of our great Travel Tips, especially the Travel Tips for Europe, before you head overseas. This entry was posted on Thursday, May 28th, 2015	at 7:12 pm	. You can follow any responses to this entry through the RSS 2.0	feed. Both comments and pings are currently closed.